As a native of landlocked Chicago, Ellen Sack developed wanderlust early in life. She started traveling to Europe at 19 and has been at it happily every after, developing a love for Europe, particularly Europe by barge. 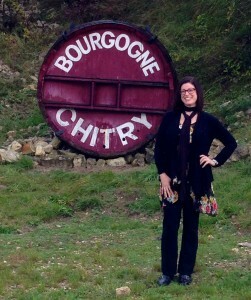 She took her first barge cruise in 1984, and shortly thereafter decided she wanted to help others discover the pleasures of barge travel, opening her travel agency, Barge Lady Cruises in 1985. 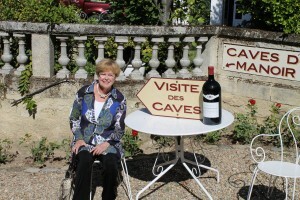 Ellen’s reputation makes her a leading expert in European canal barge cruises. Today she represents over 50 different barges, and employees a small staff that include her daughters Caroline Sack Klein and Stephanie Sack. Between Ellen and her entourage, Barge Lady Cruises visits each and every one of the barges she represents before she recommends them. A vast network of preserved waterways wind through the heartland of Europe, navigated by a fabulous fleet of floating house parties, ranging from the leisurely low-key to the over-the-top opulent. 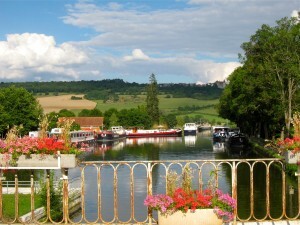 Welcome to the world of barge cruising, where happy travelers aboard these marvelous vessels enjoy a prime perch for ogling old-world wonders, visiting vineyard-strewn valleys in the unspoiled countryside, and attending bustling markets in charming villages. 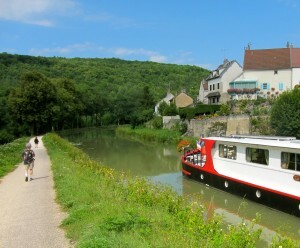 While often confused with river cruises, which typically traverse several hundred miles on Europe’s major rivers on large ships carrying over 125 passengers, barges are handsome vessels converted from reclaimed cargo boats into luxurious floating hotels, carrying four to 22 passengers which cruise through European canals, primarily in France. Barge cruising’s intimate ambiance and leisurely pace appeals to a sophisticated traveler with culinary and cultural leanings. 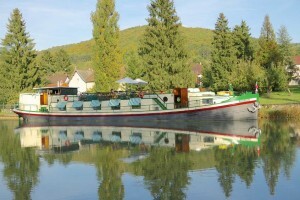 Choosing a barge cruise perfect for a dream European vacation depends on your group, your travel preferences, and your budget. Although there is no official rating system for barge travel, The Barge Lady created her own system, classifying barge cruises into four categories: Boutique, First Class, Deluxe, and Ultra Deluxe. These classes are determined by a handful of factors, primarily the size of the cabins, on-board amenities such as decor, deck space, and number of crew members. Ratings are affected by the number of guests; for example, an eight-passenger boat can earn a higher rating than a 22-passenger boat. All barges at all ratings are available for chartered groups. The Barge Lady especially likes to recommend Boutique Class vessels for smaller parties more interested in authentic experiences than in on-barge amenities. This curated collection of barges are operated with two in crew and offers the opportunity to take some meals onshore at local restaurants and auberges, all organized and selected by the captain. 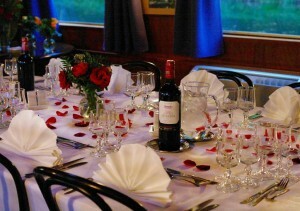 From $3,500 per person, they are the perfect barge cruise for those who wish to spare the expense, not the experience! 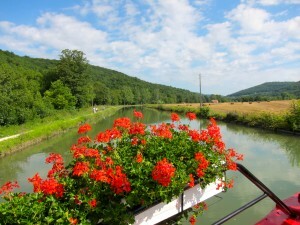 The barge cruise season runs from mid-April through the end of October, taking advantage of Europe’s mild spring, summer sunshine, and temperate autumn. Although barges fill quickly, dates are still available for some vessels in 2015 and 2016 already beckons, so call The Barge Lady (800-880-0071) and we’ll help you the perfect barge cruise to meet your needs. NOTE: For a peek at the wonderful food served on barge cruises, have a look at the Pear and Roquefort Quiche recipe from the Horizon II barge and the beautiful Salade Reine Pedauque served on the Reine Pedauque.